Five-time world champion Raymond van Barneveld announced his immediate retirement after a Premier League loss to Michael van Gerwen in Rotterdam. The Dutchman's elimination from the tournament was confirmed on Wednesday after his defeat by Daryl Gurney. "For me, I've made a decision, I'm done now," the 51-year-old said in his post-match interview with Sky Sports. "I don't want the pain anymore. It's good to see that everyone loves you but they don't have one single clue what I'm going through. "It's pain every single week for for the last three or four years. There's never a feeling, apart from winning the World Cup with Michael [Van Gerwen], like 'Hey, Ray, come on, we're back'." 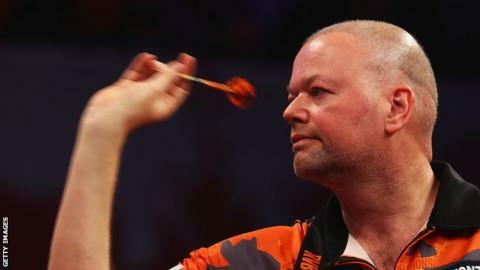 Van Barneveld, known as 'Barney', had announced in November that he would retire following the PDC World Championships at the end of 2019. A lack of form in this season's Premier League culminated in his elimination on Wednesday, prompting him to say he was bringing his retirement date forward. However, in a later post on Van Barneveld's Twitter page, his manager Jaco van Bodegom said: "Raymond had had a very tough two nights and in all his emotions he said he was going to retire right away. "I just spoke with him and we agreed it is better to take a couple of days to clear the mind and think about the future." One of the greatest darts players of the modern era, Van Barneveld is one of only three players to win five world titles. In week nine's other matches, Rob Cross beat Dutch "contender" Jeffrey de Zwaan, a result that means all nine players to have filled in for the injured Gary Anderson have failed to register a win in the tournament. Elsewhere, Gurney overcame Mensur Suljovic in the first match of the evening, Gerwyn Price came from behind to defeat Peter Wright and James Wade beat Michael Smith.